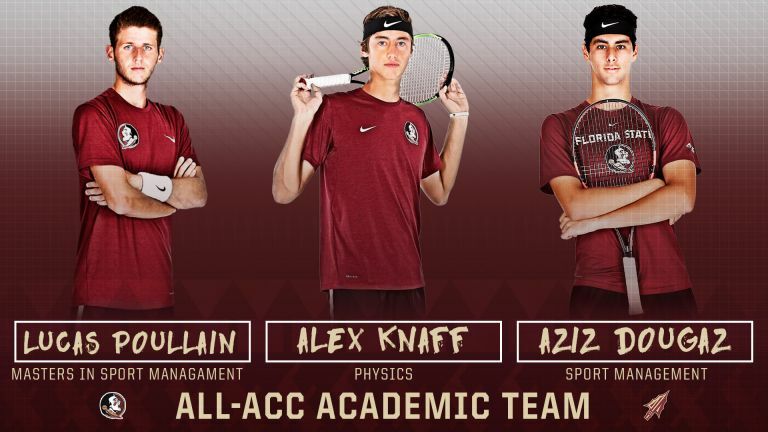 TALLAHASSEE, Fla. – Florida State’s Aziz Dougaz, Lucas Poullain and Alex Knaff have been named to the All-ACC Academic Men’s Tennis team. Lucas Poullain was named to the team for the second straight season in his as many years at Florida State. Lucas Poullain (Nantes, France) was selected to the All-ACC Academic Team for the second straight season after being named to the All-ACC team earlier this year. Poullain was named second-team All-ACC after his 24-1 record in the spring, he was also selected to the NCAA Singles Championship where he made it to the round of 32. Poullain earned a 3.75 GPA this season while pursuing a master’s degree in Sport Management. Aziz Dougaz (La Marsa, Tunisia) was named to the All-ACC Academic Team for the first time. He was 19-6 in the spring with most of his matches on court one. He qualified for the NCAA Singles Championship and was named the ITA Player to Watch in the Southeast Region. Dougaz is pursuing a degree in Sport Management. Alex Knaff (Luxembourg, Luxembourg) was named to the All-ACC Academic Team for the first time. He went 12-3 in the spring and earned ACC Doubles Pair of the Week honors with partner Guy Iradukunda after a 2-0 weekend against FAMU and the Citadel. Knaff is pursuing a degree in physics. Wake Forest junior Petros Chrysochos was named the ACC Men’s Tennis Scholar-Athlete of the Year.